We cannot imagine our wedding without the exceptional work and efforts of Elycia! Her aesthetic eye and sustainable methods ensured that our day was both beautiful and environmentally conscious. Elycia took the time to understand the spirit of our event and only used flowers that were in season and locally sourced. 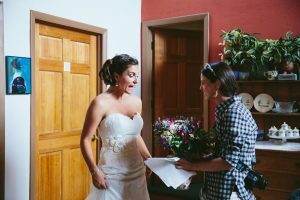 Even though flowers can be the most environmentally unfriendly part of any wedding, Elycia’s time and effort ensured that the flowers stayed within our eco-friendly goals. Among the flowers she used bundles of lavender and sage, which added a wonderful aroma in combination with the visual appeal. Elycia really comes full circle in her sustainable approach – she offers preservation services so that you can continue to enjoy the memories long after the day of. She created several beautiful pieces for us from our event flowers, and they are on prominent display in our home! We cannot recommend Elycia more. She is one of the sweetest souls we met during our whole wedding planning process and truly one of a kind! I absolutely love my framed wedding flowers! Elycia did such a fantastic job, she communicated with me throughout the whole process and sent ideas and recommendations. My flowers dried wonderfully and I love that I’m now able to keep them in more creative way than having a dried bouquet hidden somewhere in my home because I would be too nervous to keep that on display for fear of it being damaged. 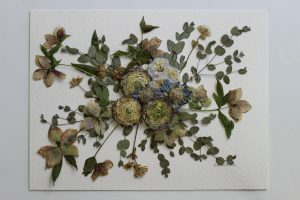 I highly recommend Elycia’s work to anyone who is looking for help in ways to preserve their wedding flowers. Our daughter was interested in preserving the flowers from her wedding in November. Elycia suggested a dried wreath arrangement. She made it easy and convenient for me to drop off the flowers on a Sunday morning after the wedding the night before. 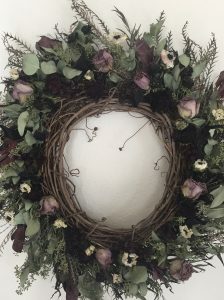 The wreath is lovely and captures the essence of the floral arrangements completely. The bride and groom are thrilled. Our Residents love when Elycia visits! As the Life Enrichment Coordinator here at WindSong at Northridge I cannot say enough about Elycia! Her flowers are always fresh and beautiful and so is she. The residents look forward to seeing her and her flowers. Her love for the residents and what she does is so very obvious. She provides meaningful classes and understands the need for extra instructions for our residents. We cannot wait to see her in August for our Floral Arranging class, She promised us Roses! She brings joy to our residents! I’m the Executive Director at Windsong at Northridge and Elycia has brought such joy to our residents. She recently did an activity with the residents in which we made beautiful centerpieces for the dining room and front lobby. I attended and had a blast. She’s now on our schedule regularly. They were elegant and we learned about the flowers we were using and how to best preserve them. She also provided flowers for our Housewarming Party and we received many compliments about them because they made the community feel warm and welcoming. If you have a special event coming up I highly suggest her services. She has great style! Elycia was absolutely beyond easy to work with! She initiated her own plans for our Open House before we even met and went over colors and even scents that the flowers would produce for the event and what would accent our theme! The flowers were absolutely stunning and lasted more than a few days after the event! She themed the flowers to fit our company’s colors and the theme of the party. She was so easy to work with, I didn’t even realize she had already arrived the day of the event until I saw the flowers were already set! I also have purchased prints from her and the artwork is absolutely lovely! I would recommend Wild Blossoms to anyone having an event or even just needing a beautiful bouquet! The flowers were absolutely perfect. Things went perfectly! Thank you so much! The flowers were absolutely perfect. Thank you again. I couldn’t have asked for more. Oh my gosh! How is it already over! Thank you so much Elycia for the thoughtfulness you put into each bouquet! They radiate with love. I’m so glad you were a big part of our wedding. It was a really busy week last week, but I’ve been meaning to send you an email to thank you for the beautiful floral arrangements. I knew I could trust you to create something beautiful and you far exceeded expectations and hopes. The centerpieces, ceremony flowers, and all the other details were so unique and made the whole event look like we all spent a lot more time planning and thinking about it than we did. The flowers were my favorite part of the entire wedding décor. Words can’t describe how beautiful the bouquet was. You incorporated everything I was hoping, and it looked exactly how I was hoping it would. I’m excited to keep a bit of it hanging on the wall for years and years. I also loved Stella’s crown. What a great piece for her to wear down the aisle. You have a tremendous skill and I’m so glad you were a big part of our wedding. Thank you for just doing what you do best! Everything was more than beautiful. Your floral and botanical arrangements were so beautiful. My name is Meghan Shaw and I photographed Brian and Amanda’s wedding last July 4th… I have been meaning to get in touch with you for a very long time, and I finally am doing so… your floral and botanical arrangements were so beautiful, I kept thinking of them as sculptures and I took quite a few pics of them! We’re SO impressed with your flowers and services! We’re SO impressed with your flowers and services. The two large arrangements of flowers were absolutely gorgeous and my bouquet was stunning. Not to mention, everyone loved the scent and the visual of the table center pieces! We never doubted for a minute that choosing you as our florist was a fabulous choice. I cannot wait to see the pictures from our photographer. I will most certainly be encouraging friends and family who are planning on getting married to have Wild Blossoms as their florist. Thank you again, and we shall talk soon! Elycia my wedding day was perfect! So your arrangements were gorgeous! I am so happy about how everything turned out. Elycia my wedding day was perfect. Thank you for helping and creating such beautiful centerpieces. Oh my goodness!! Everything was absolutely GORGEOUS!! I’m so glad we were able to work together for my wedding because absolutely everything exceeded my expectations!! And I’m sooo thrilled you were able to add the mantel and cake greenery!! They both looked incredible! Seriously everything was perfect and I cannot wait to get pictures back to share with you! No one had ever seen anything like them! I seriously can’t thank you enough for the awesome bouquets you made for our wedding! They were perfect! No one had ever seen anything like them and everyone loved them. They looked so cool, way beyond anything I could have imagined.